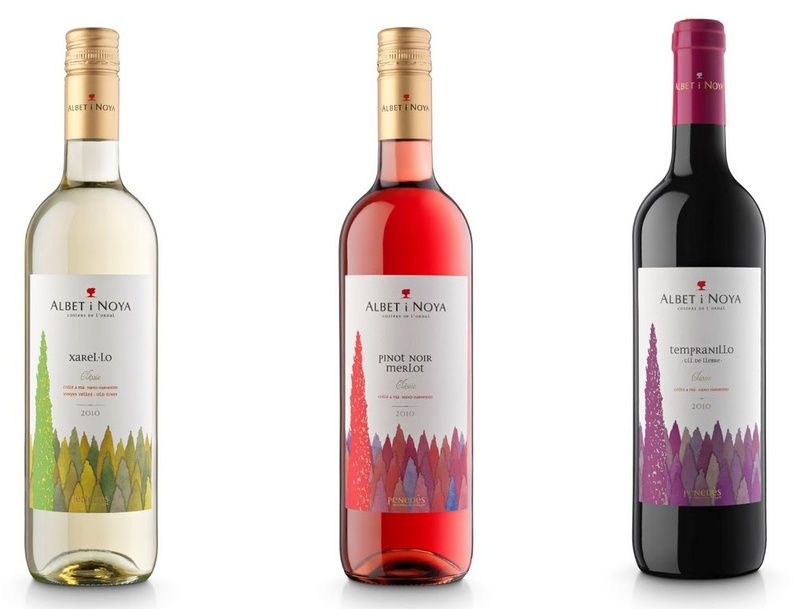 The new 2010 Albet i Noya Clàssic, comes out with a new image for these three wines: Xarel·lo for whites, Pinot Noir for rosés and Tempranillo for reds. This range now has a more colourful and modern label. The label for the "clàssic " has stopped being so traditional and has taken on more up-to-date, avant-garde lines. Undoubtedly, the image stands out for its clarity in having substituted the cypresses with small feathers, for a "Gerard Medina" watercolour and its pastel but bright colours, colours that subliminally identify the product inside very well. For the Xarel·lo Clàssic, the dominant colour is green with hints of yellows that aim to express a young white wine, fresh, aromatic, with hints of white almond tree flowers, green apple, tasting of comfits and apple, being the genuine expression of Xarel·lo when it is made into wine and consumed as a young wine and, if consumed in its second, third or even fourth year, it evolves towards more complex notes, acquiring volume in the mouth and expressing the minerals of the calcareous lands of Costers de Ordal, the area where Xarel·lo offers its maximum expression. The pinkish cypresses of the Pinot Noir Merlot Clàssic identify a fruity rosé wine with hints on the nose of red fruits like currants, berries, strawberries or cherries, which are the body of this great 2010 rosé wine. The Tempranillo label is very much related to the colour of this wine in the glass, Tempranillo has those dark reds, high tonality, (especially when it is young) nearly fuchsia and even in the glass makes a bit of a violet crown, denoting the fruitiness on the nose where we find the clear signs of berries and liquorice as well as cherry comfit and, in the mouth, the silkiness we find seems like the same texture as the paper the label is made of. The change has been made following the line that the labels had in previous years so that the public can easily identify the wines, but we wanted to call their attention and make the labels more attractive for young people who are starting out in the world of wines, looking for wines that easily express themselves, visually as well as in the tasting sensations and with a good price-quality relationship. Therefore, 2010 is expected to be excellent for these new classics too, classics with a total air of quality that bet on modernity and youth for its wines as well as its public.